At this rate there won't be any books or papers left in the pug school! Fortunately, the main thing on the curriculum is "begging" and you don't need books or pencils in order to work on that! I had to pay for a library book. I wish I could use that excuse! This is funny! When I first got my puggle Bubba Jay (who's more pug than beagle) he tried to eat all my homework. Chunky ate my daughter's homework once last year. 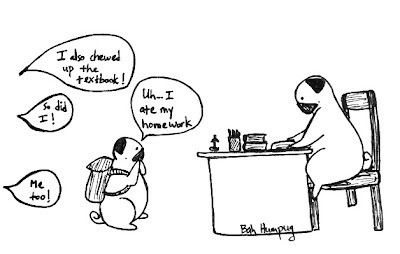 I'm a teacher so I thought it was funny that a dog REALLY ate homework. Now we keep the homework up high where he can't reach it.